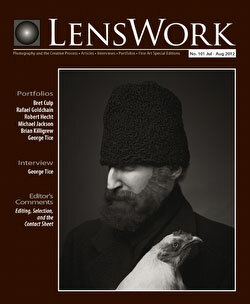 be joining the company of so many fine LensWork Photography Alumni. short years ago. I’d like to give a big thanks to Maureen and Brooks. photographers, often an article by a guest contributor, and an Editor’s Comments. lots of additional content that simply won’t fit in the 96 pages of LensWork. Each issue typically includes 7-8 media monographs — including expanded presentations of the portfolios in the print version. LensWork Portable is formatted specifically for the iPad, Android and similar portable devices. be amazed at the extent and depth of content in this website! I was just on Skellig a few weeks ago. An amazing place. Could not go up as the weather was too windy and wet. Too dangerous. Your images make me want to go back and hike up for sure. Well done. Congrats on your acceptance to Lenswork. A personal goal for me too. It definately seems that you must have the luck of the Irish to gain access to Skellig Michael. I would also like to return at some point. I'll be looking for you in LensWork.